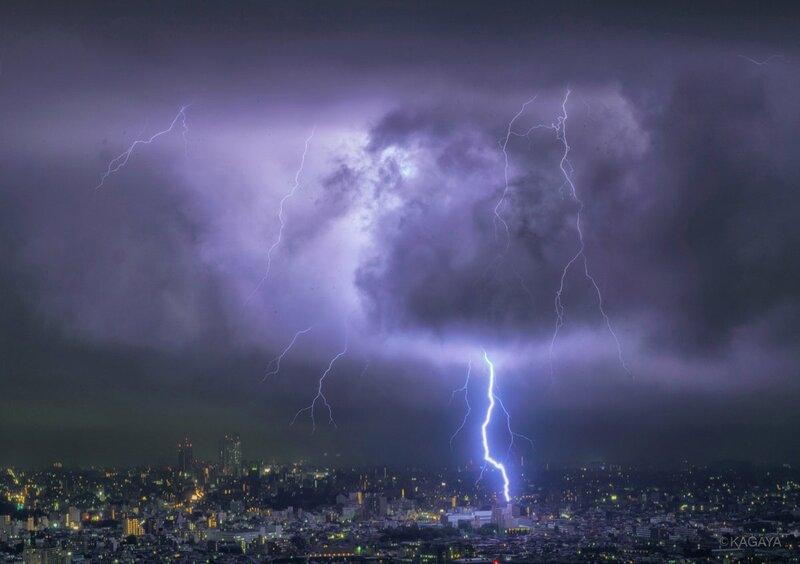 After almost five years of exploring Tokyo (! 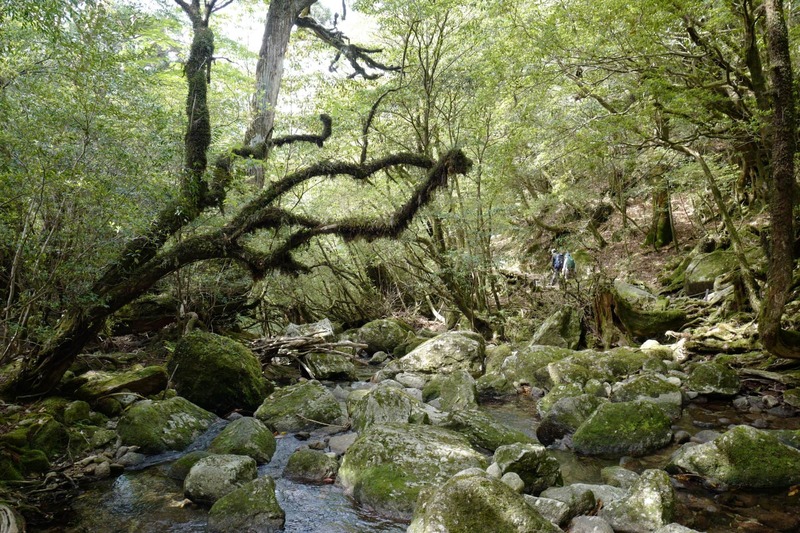 ), it has become increasingly hard to find hidden historical gems, such was the destruction caused by the 1923 Great Kanto Earthquake and the 1945 WWII bombings to old wooden buildings. 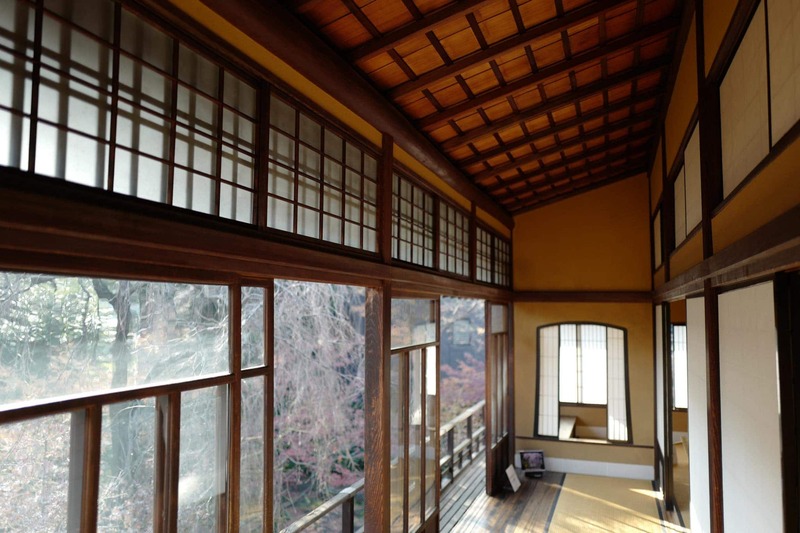 At the end of 2017, I discovered The Former Kusuo Yasuda House and Gardens (旧安田楠雄邸庭園) which miraculously survived and is open to the public by The Japan National Trust. 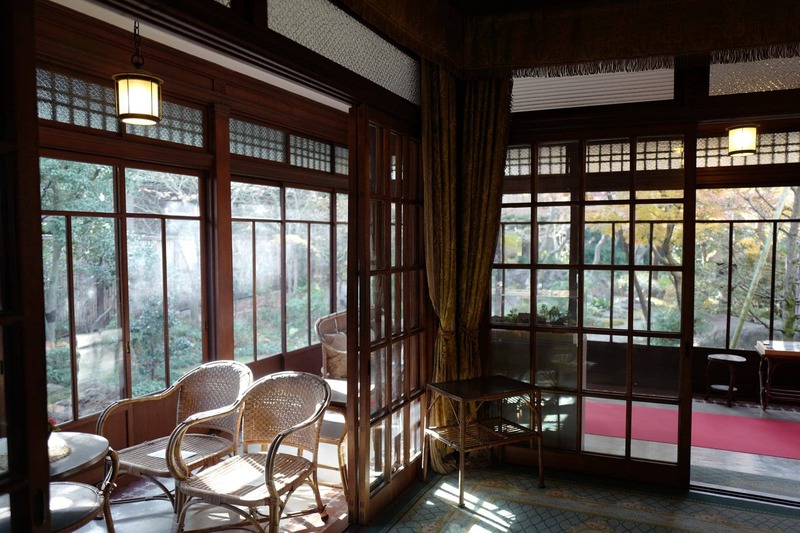 Located in the quiet Sendagi residential district of northwestern Tokyo, the house was built in 1919 for Yoshisaburo Fujita, a businessman and connoisseur of traditional architecture. 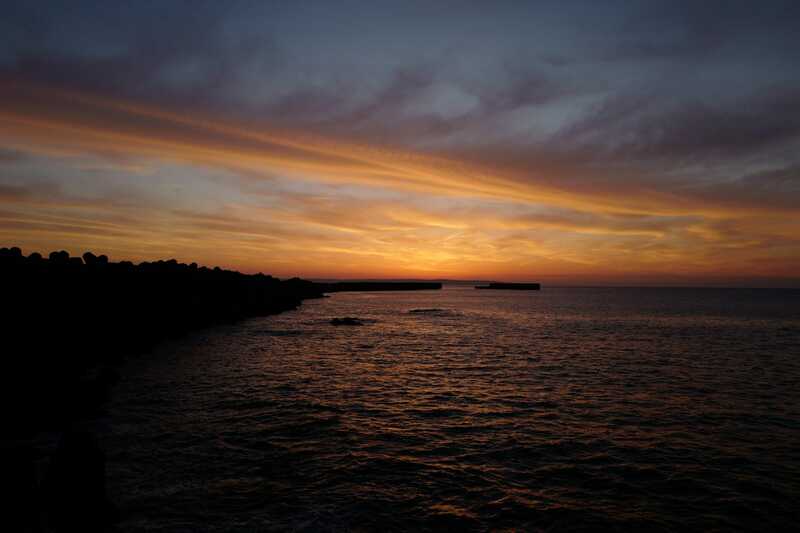 After living there for only a few years, he sold it to Zenshiro Yasuda, whose family ran a large banking business. 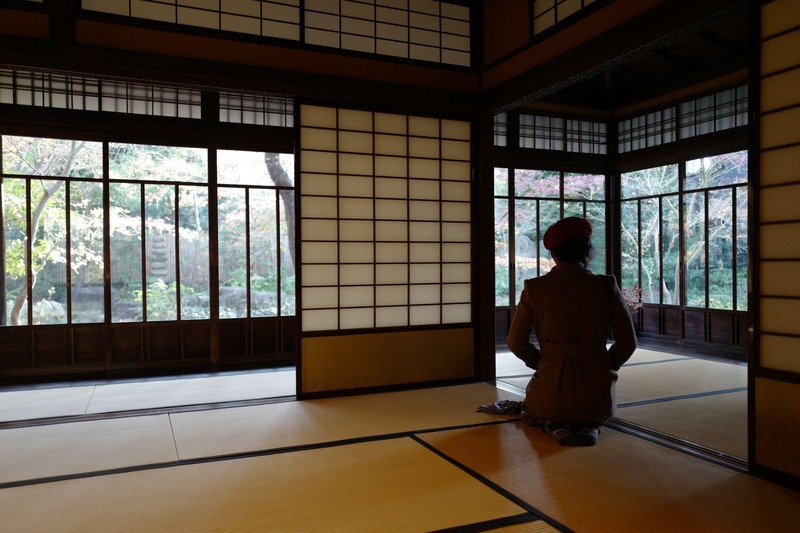 The house remained unchanged until 1995 when, after the death of Zenshiro, his widow donated the property to avoid the huge inheritance tax. We were treated to a comprehensive guided tour by a volunteer on a chilly winters morning. The information below is summarised from the property pamphlet. 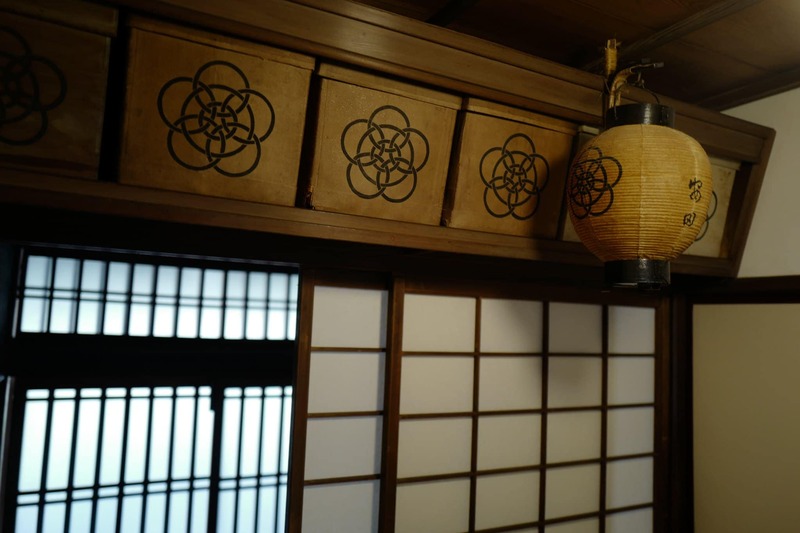 Beside the main entrance and waiting room is an informal entrance, above which boxes on a shelf bear the Yasuda’s family crest and contain paper lanterns used outdoors in the evenings. Standing here you can look down the long tatami-matted hallway. 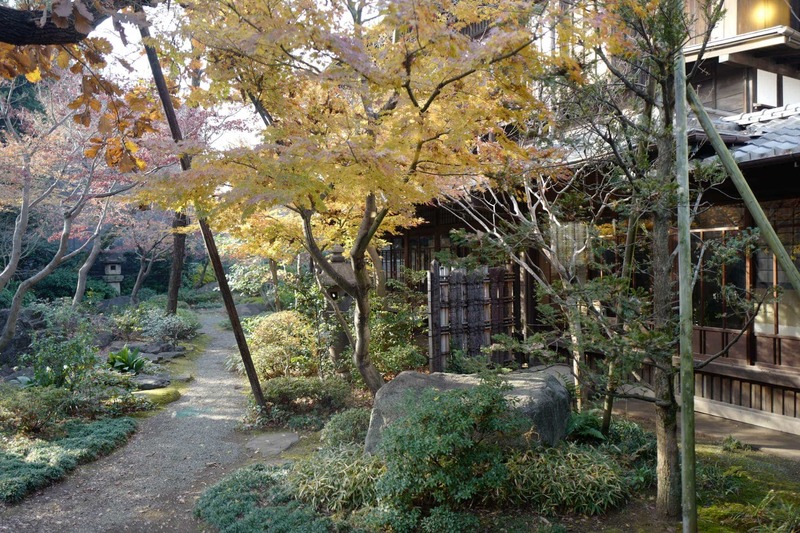 To make the most of the narrow, deep lot, the building zigzags giving each room its own unique view of the garden. 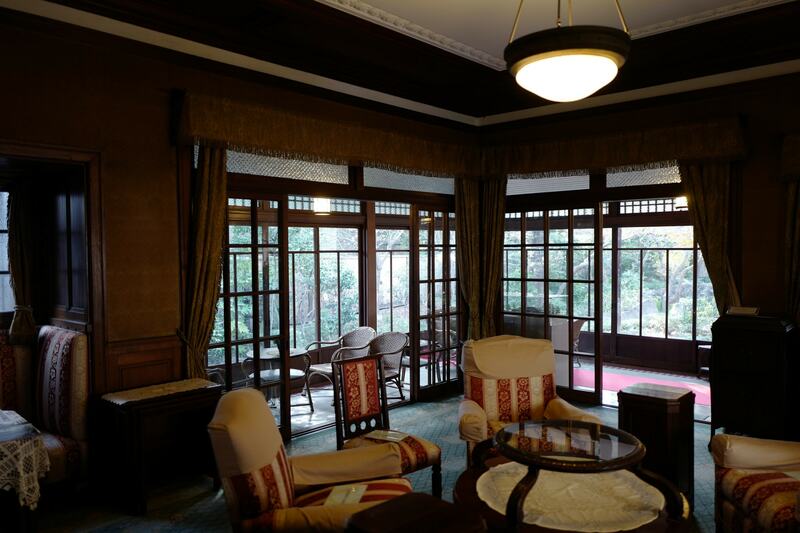 High-ceilinged, carpeted and furnished with tables, chairs and curtains, the spacious room is the only one in the house decorated in a Western style. 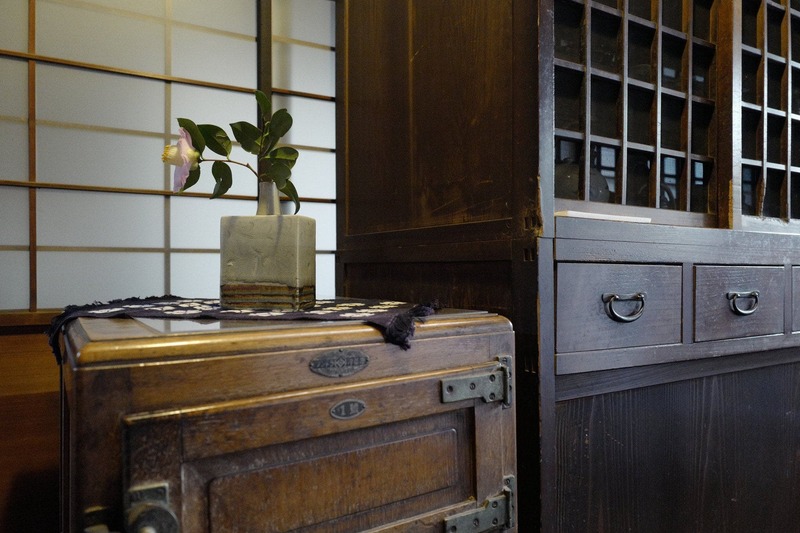 What appear to be wooden chests next to the chairs, actually contain hibachi (火鉢) charcoal hand braziers used to warm the room in winter. 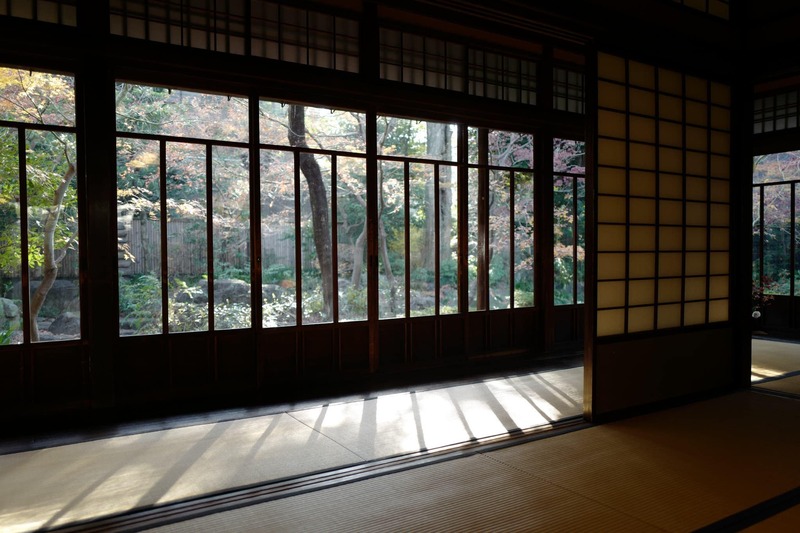 From the sunroom corner windows, you can see the narrow, deep garden with a gravelled path winding through the woods and stones. 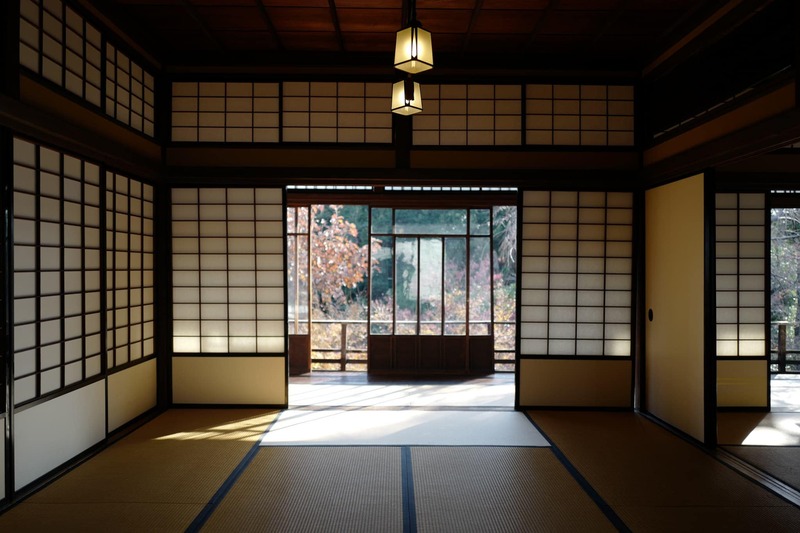 Also known as the Zangetsu Room, named after a tea house in Kyoto which inspired the tokonoma (display alcove) in one corner which was used by the Yasuda family to exhibit their collections of precious dolls and miniatures. The garden was designed for best view as you see it sitting directly on the floor. 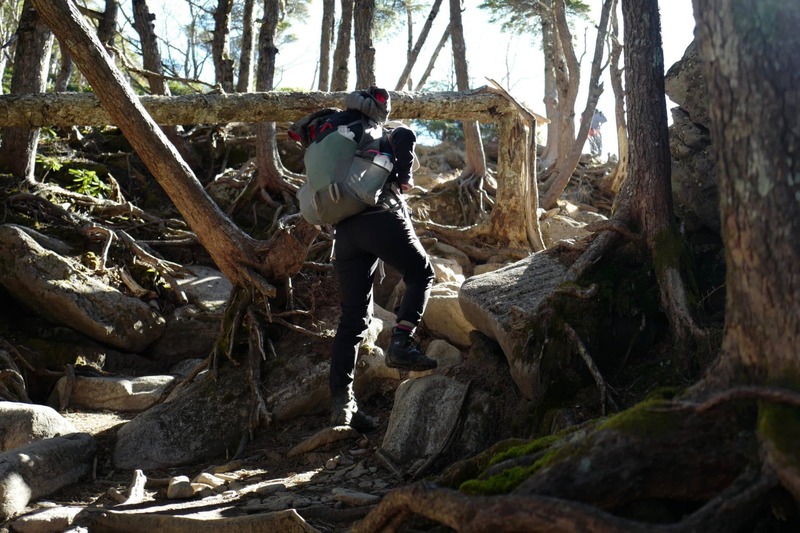 The dry rock landscaping is designed to recreate a valley with a waterfall and stream. 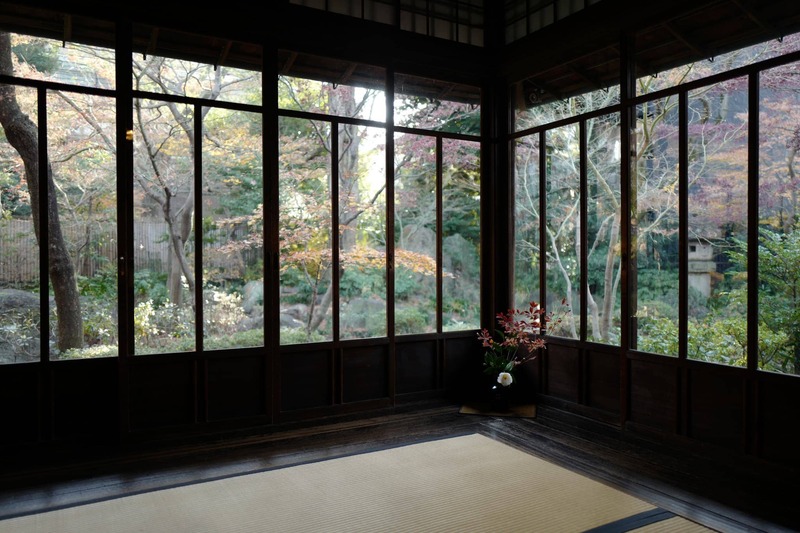 An underground bomb shelter built during WWII remains in the garden and is accessible beneath the tatami mats in the hallway. 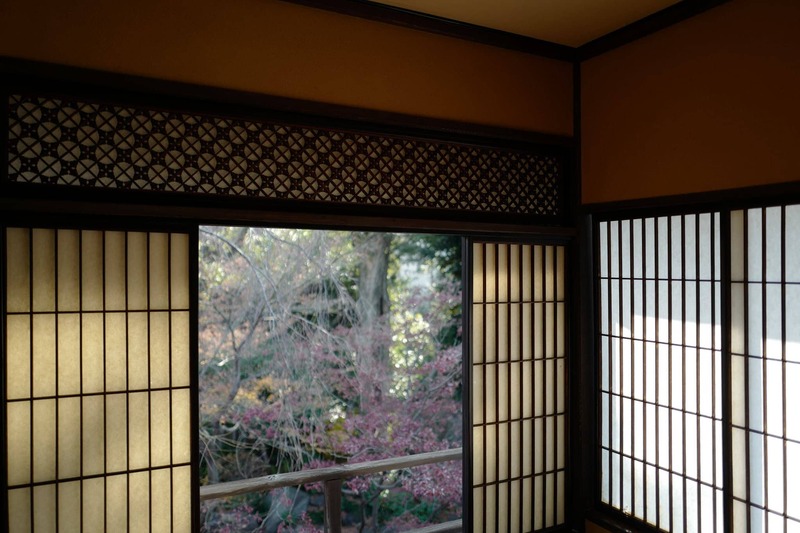 In this more informal room, the ceiling is lower and a square view of the garden is afforded through the shōji latticed paper doors. Each door has sliding panels to allow the garden to be viewed even when closed. A kitchenette is installed discreetly in the closet for quick tea service. Family members and friends would gather here to talk and eat. 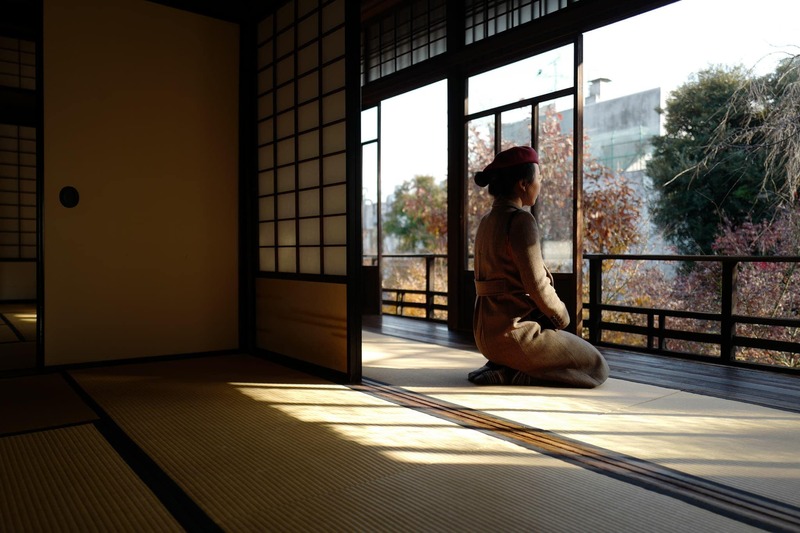 Photographs on the wall show three generations of the Yasuda family. 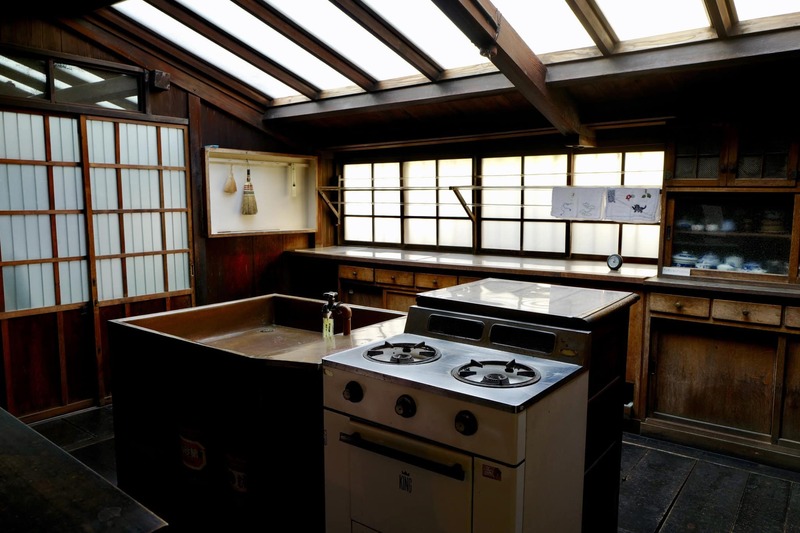 Set below large skylights with a central island containing the sink and oven, the kitchen was very modern by Japanese standards of a century ago. 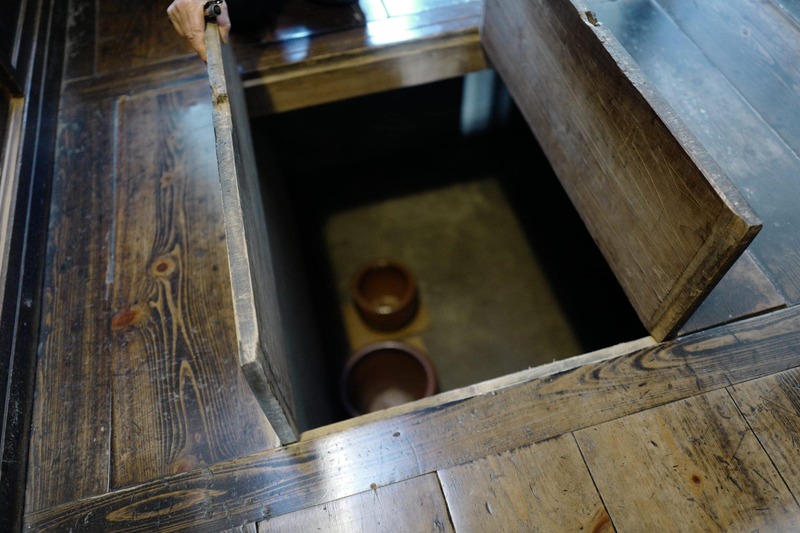 Below the floorboard is a shallow cellar which was created within the cement foundations, also rare for the time given the high expense. 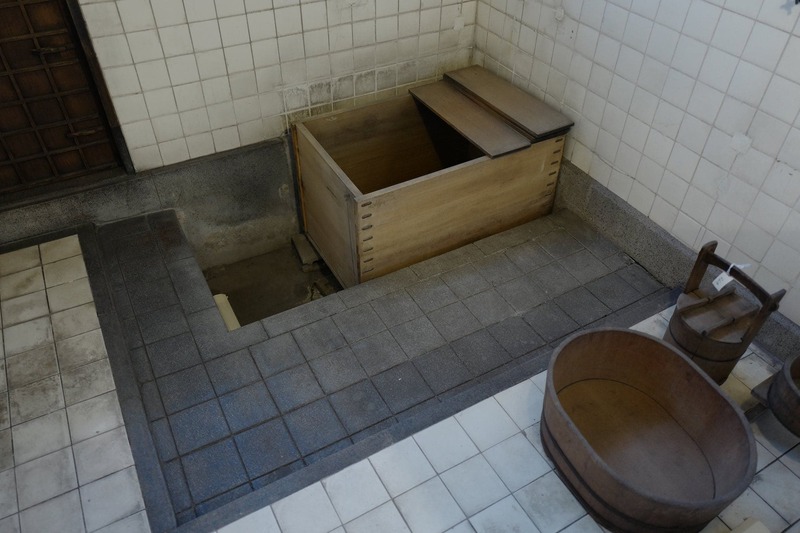 The hinoki cypress bathtub set in the tiled floor is smaller than the original bath used by the family. There is also a shower on the wall which was plumbed into a boiler in the kitchen. A copper plate-covered sink in the dressing room provided a convenient place for women to wash their hair which was kept particularly long in the old days. 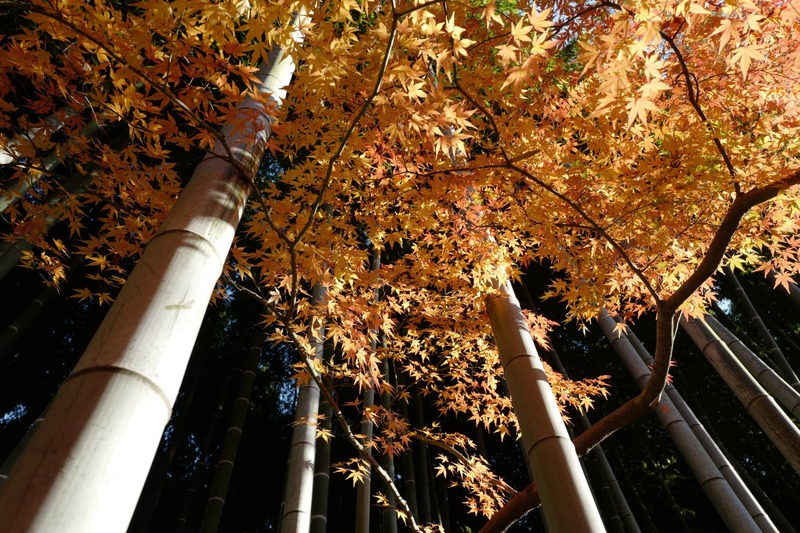 The corner room on the second floor has wonderful views over the garden which are particularly beautiful during autumn when the maples are ablaze. 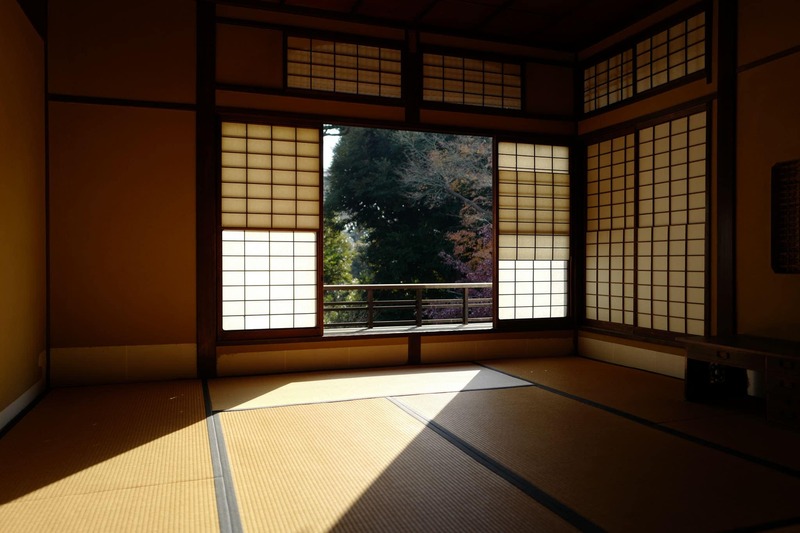 The windows have panels which slide over glass panes. 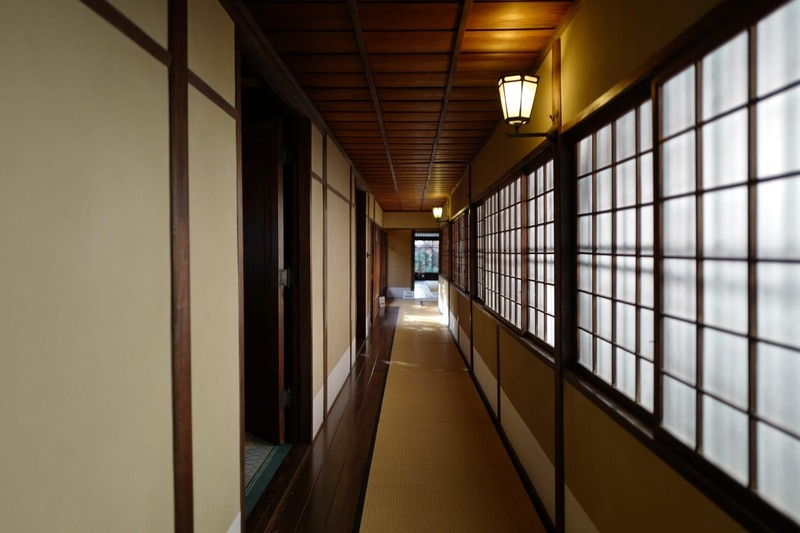 Across the hallway is a tea service area. 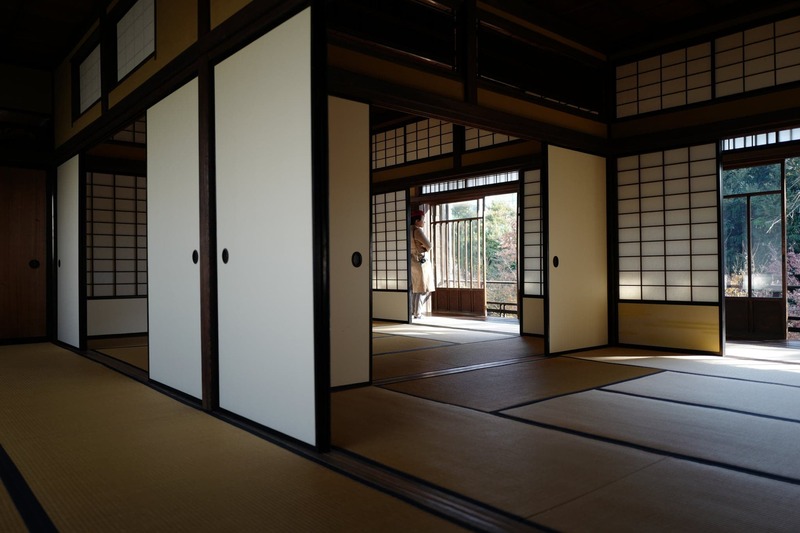 The two tatami-matted rooms on the second floor are designed as the most formal area of the house. 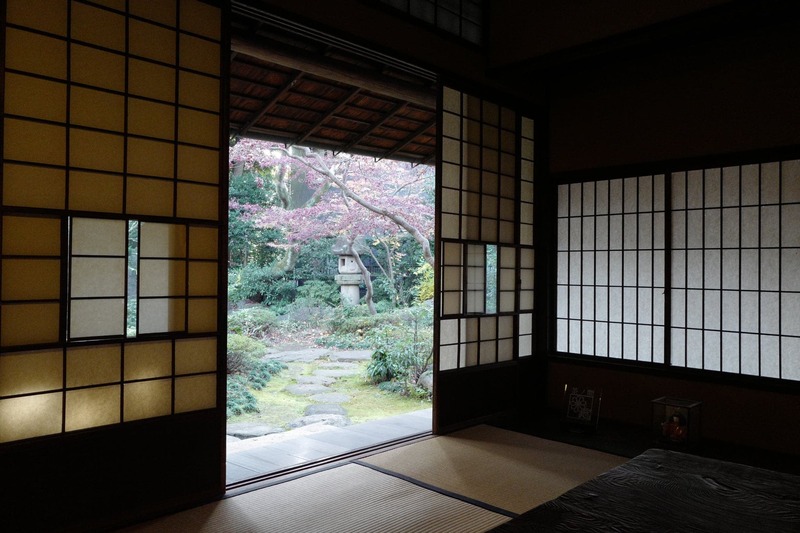 Sliding doors run the entire stretch of its garden side and the tokonoma is wide enough to hang three scrolls. 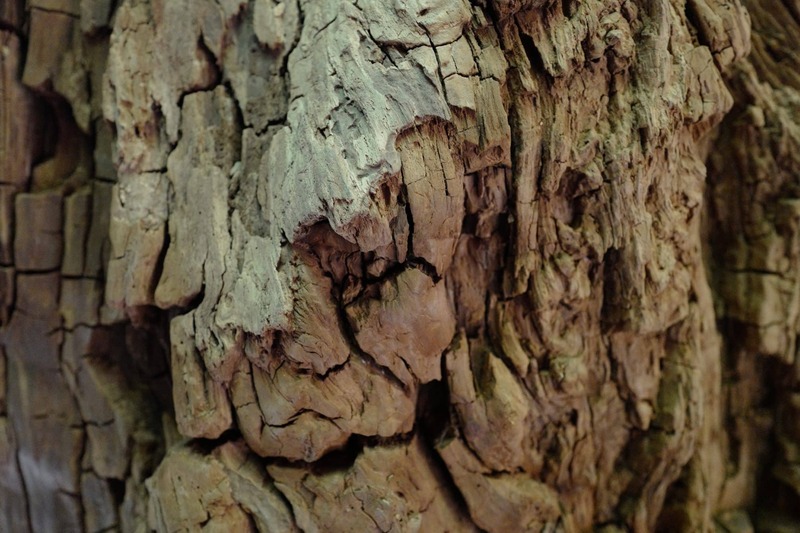 The corner pillar has a dense, vertical grain running on all of the four sides, proof of the most high-quality wood. 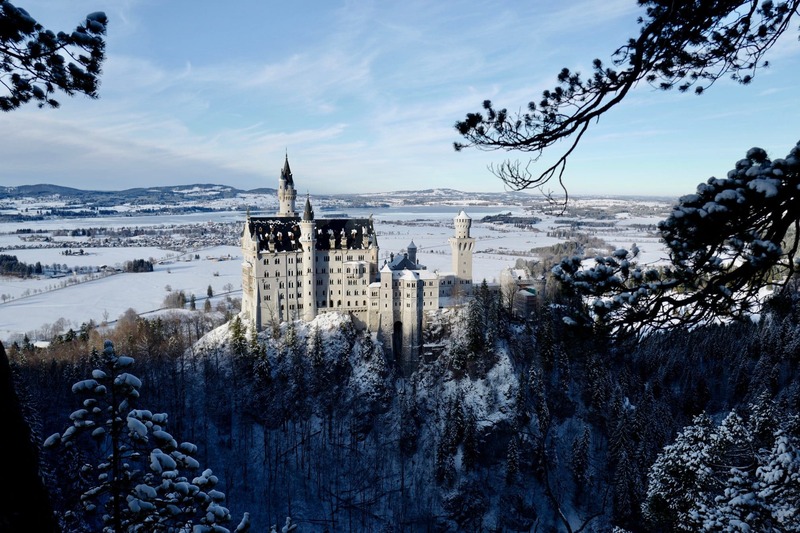 There are also many examples of intricate wood joinery. 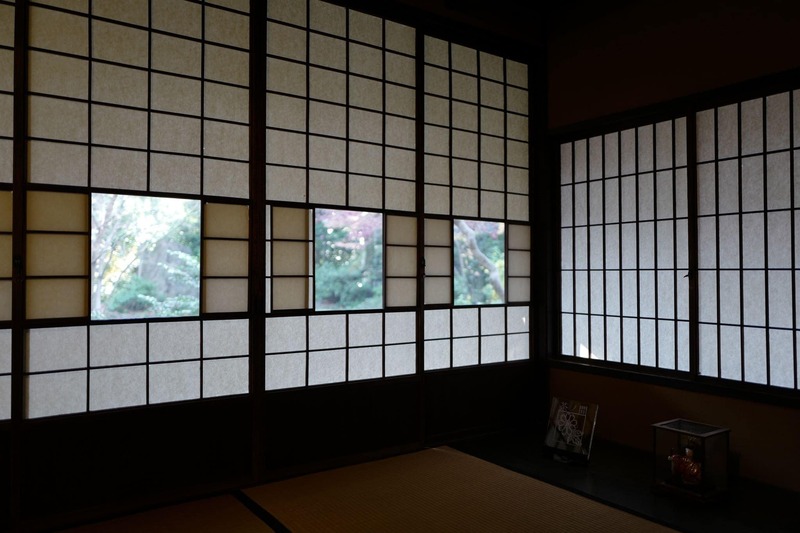 The tatami mats in the rooms feel softer than those downstairs because the straw padding underneath the plaited surface sheets is original work from 1919. 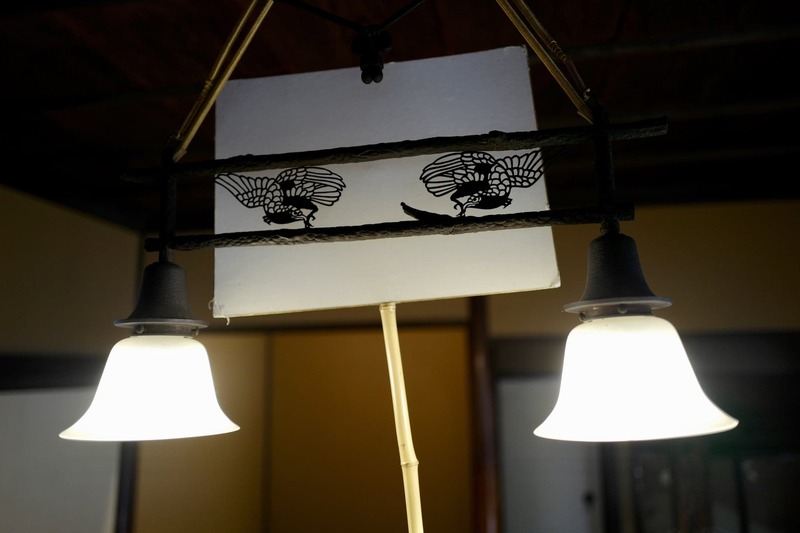 When the surface sheets were replaced during the house’s restoration, workers discovered the signature of the original craftsman on the narrow wooden rims. 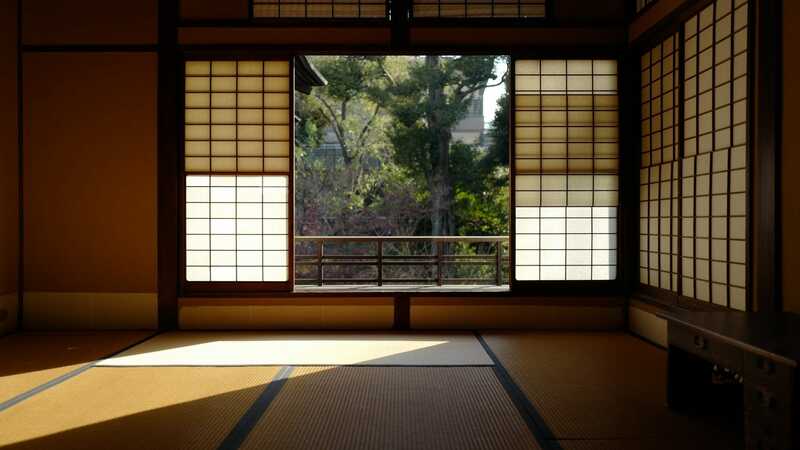 In summer, delicately woven bamboo curtains which swing gracefully in the breeze replace the paper doors. 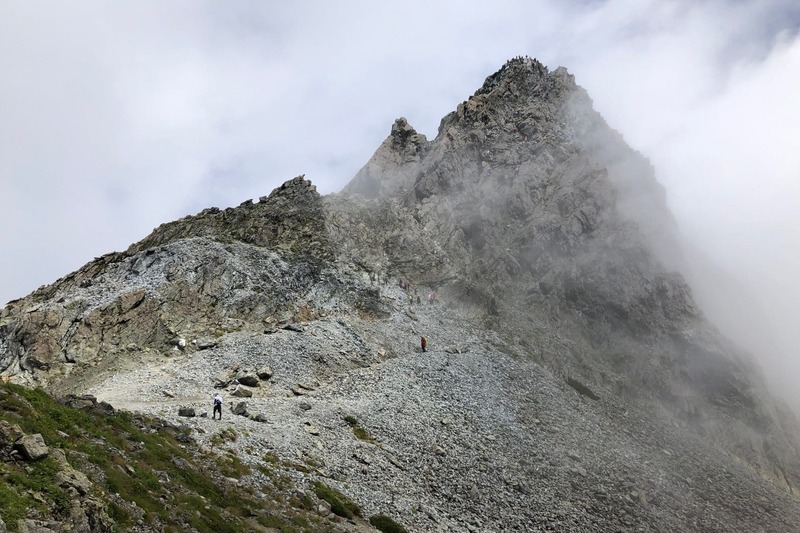 That the house has remained in such good condition for almost 100 years is a testament to the incredible craftsmanship and quality of materials. The house has special open days to highlight areas and items not usually on display so I hope to pay a second visit this year.